AccuMail toolkits easily connect into your other address-dependent applications. 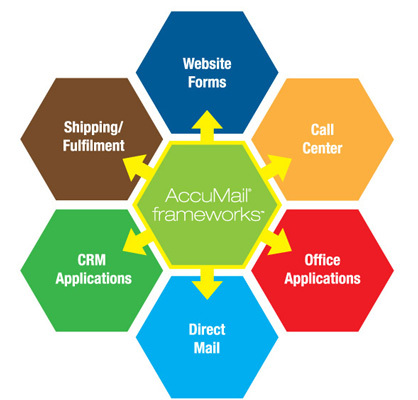 AccuMail frameworks can be incorporated into virtually any application that relies on customer address data. Our Developers' Toolkits allow you to integrate AccuMail easily into your custom developed or commercial, off-the-shelf software applications. The powerful AccuMail engine works behind the scenes, allowing you to validate and correct addresses in real time at the point of entry, and perform batch corrections on your entire customer database as often as you like. CRM Databases - CRM (Customer Relationship Management) systems are only as good as the data within them. AccuMail is compatible with many popular CRM applications, such as SalesLogix, Goldmine and ACT! Shipping/Delivery Systems - Validate/correct addresses before you ship, cutting address correction penalties and speeding up the delivery process. Websites - Validate your customers' address data as they enter it, to ensure the quality of your database and minimize customer service issues later on. Call Centers - Correct your customer data at the source - the point of entry. Don't take another order without AccuMail frameworks to validate your customer information as it is entered. Office Applications - Use our macro installers to hook into popular word processing applications such as Microsoft® Word and Corel® WordPerfect® for address verification within your documents. Direct Mail - CASS Certify your mailing lists, and run them through our NCOALink process, AccuMail Move. Used with our postal presorting software, ProSort, your mailings can qualify for generous postal discounts. Contact us today to find out how easy it is to incorporate powerful address correction functionality into your everyday business processes and start enjoying the benefits across your entire organization. If you want to give the quality of your address database a boost, or want to claim postal discounts for a bulk mailing, but don't want to commit to an annual subscription, AccuMail frameworks is available in a single update format too. 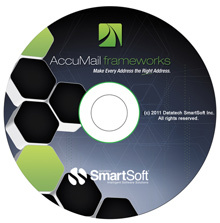 With the AccuMail Shot you enjoy the power of our high-end AccuMail frameworks address correction and mailing applications whenever you need them. Plus, if you decide to upgrade to the full annual subscription of AccuMail frameworks within 2 months of purchase of the AccuMail Shot, we'll discount the purchase price from your annual subscription! For more information on the AccuMail Shot, please contact us.